The Erica is pure class, these on trend low back Deb dresses with statement illusion back will stop the show. 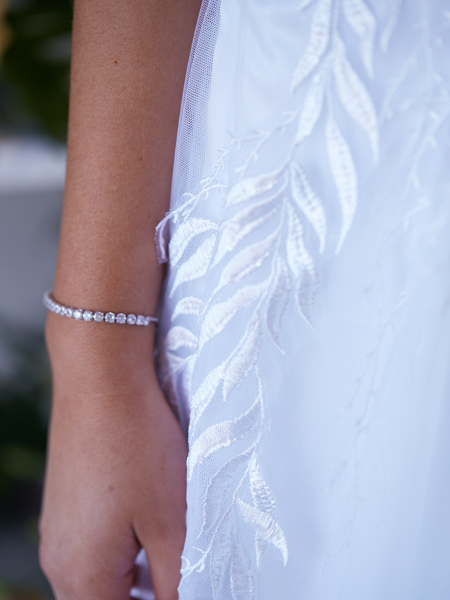 A deb dress like no other, for the girl who will not compromise on style. Let face it who doesn’t want to be the understated belle of the ball. With a soft and sweeping skirt you will be able to dance and flounce all night long. Did I mention the back! you will love it. 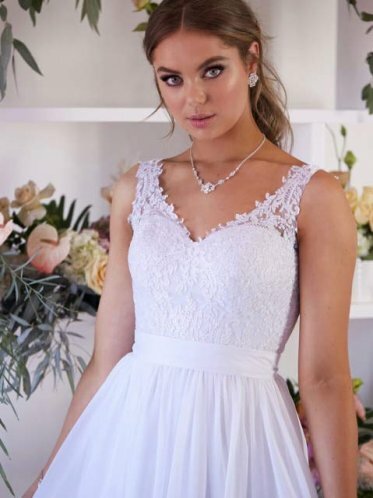 Brides to be don’t worry we have a bridal version wedding dresses with a train in ivory or blush and ivory. Fabric and design the outer layers of the Erica debutante dress are made from a soft tulle with a soft satin lining. 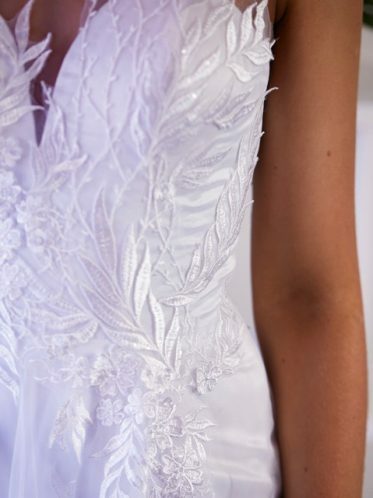 At the front with a leafy lace trim that has a shimmering sequin trim overlay. The illusion back deb dress has an overlaying lace leaf pattern. Easy alterations, most deb dresses will need some type of alteration, such as shortening the hem. We have on site alterations provided by Ginger pins. We can give you a full price list in store. I’m all about drop earrings at the moment! 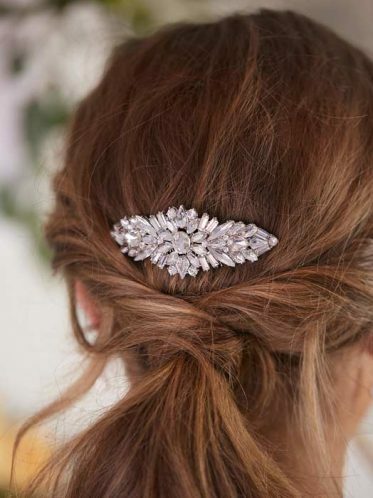 following the leaf and flower trend I love the shape of the Cinderella hair comb. 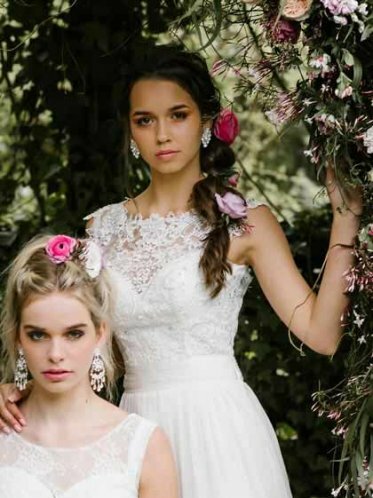 April is wearing the Chic earrings with The Erica deb dress and the Catalina wedding shoes. I love bridal and debutante shoes that match the dress, is that strange? We have a lovely collection of shoes in store. Feels unbelievable but we have been making debutantes dreams come true for almost 15 years. Saturdays can get very busy so its best to make an appointment. 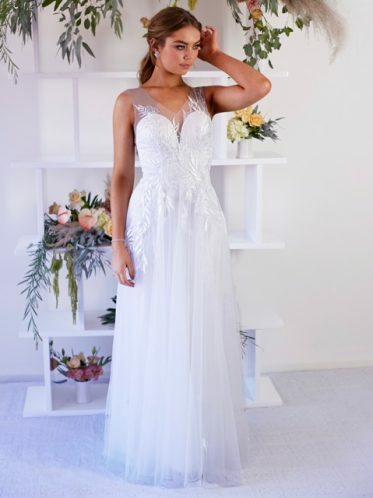 Prices for deb dresses start from $299 and lay buy is available with a 30% deposit.